We asked families to complete an evaluation questionnaire. A Small Hand opened its doors on May 14th 2010. It is a community project of Edinburg Christian Church which provides it with its space, utilities and 501 (c) (3) status. The work of A Small Hand, however, includes absolutely no element of evangelism. The Board of A Small Hand is a separate entity from the Board of Edinburg Christian Church, and there is no comingling of funds. We welcome people from other faiths and with no religious affiliation to volunteer and to serve on our Board. We enforce a stringent non-discrimination policy with regard to every aspect of our operations. Last year, we served 370 unduplicated children over the course of 6,423 visits. We spent $59,595 which translates to under $10 per visit, but families left with goods averaging $36 in value. We reached about 70% of infants eligible for our help. We served 75% more visits than in 2011, raised 35% more funds, and improved our cost-effectiveness. [i] For 2013, we are projecting serving 6500 infant visits and spending $71,500. to young infants during periods of need. We are committed to: remaining focused on the smallest and the most vulnerable, infants at risk for long-term harm from inadequate nutrition and hygiene, certain that they are never to blame for the crisis they are experiencing; supplying help at no cost, and in a manner that will encourage people to return; treating everyone coming for help with compassion, respect and without judgment; doing what we can to support people and connect them with other helping agencies; being good stewards of the goods, time, money and help donated to us - by ensuring that those assisted are in need and by keeping our costs to the minimum required to safeguard quality and professionalism. Our objectives are: [i] To eliminate food insecurity and hygiene insecurity for infants in Shenandoah County, newborn-36 months; [ii] To lift from our parents some of the burden of raising children in financially insecure circumstances, so that they can focus more on enjoying and nurturing their child; [iii] To ensure that parents have what they need to place their child in childcare, enabling them to take advantage of any opportunities for further study and work so that they can build a more secure economic future for their family. We are a single program organization providing parents with the formula, age-appropriate nutritious food, diapers and baby essentials they need for the week ahead. Mothers can also choose from our stock of gently-used clothing, blankets, bibs, towels etc., so freeing up more money for essentials in the days ahead. Since we began, we have managed to keep a full range of diapers, formulas, and food and baby essentials (such as feeding bottles, pacifiers, sippy-cups, teething rings, shampoo/wash and lotion) continuously available. We have maintained adequate stocks of clothing and books to tempt our children and their older siblings. Our books come from a variety of sources, including our memberships of Good360[ii] and FirstBook[iii]. Our County Library gives us deaccessioned and donated books; and we get regular donations from local teachers and parents. This Spring, two local teachers were funded by The Shenandoah Education Foundation[iv] to enroll children in the Dolly Parton Imagination Library[v] which mails children a new book each month until age five. We have been working to enroll our families, and the first day signed up 97 children in just four hours, which is a testament to our parents' interest in providing their children with what they know they need. We work flexibly to source quality goods at minimum cost; and believe our cost-effectiveness is one reason we have garnered community support. When we opened, our local Blue Ridge Area Food Bank System[vi] was not sourcing baby products, simply because it had no outlet that could dispose of them in volume. Now they know we can dispose of pallet loads, they bid on formula, baby foods and diapers entering the Feeding America system. Typically, formula comes close to expiry - often within a month - and so the cooperation of our parents is key. Our rule of thumb is that parents have sufficient formula from WIC to cover three weeks of the month, and so we limit parents to one week of formula each month unless there are special circumstances. When we take in a consignment of donated formula from the Food Bank, parents are asked to set aside their WIC formula and use the Food Bank formula immediately. Usually, families get a 3 month allocation of formula, enabling us to distribute the Food Bank formula before expiry. This only works because our parents are responsible and frugal. We joined the National Diaper Bank Network [NDBN][vii] soon after it was formed in 2012, in part to learn more about diaper procurement. In April 2013, we were selected to become a Community Partner of NDBN[viii], one of 15 across the USA. As a Community Partner, we will receive 250,000 diapers each year for the next two years and pay $5,000 per annum. The award carries with it the responsibility to explore regional expansion. We have demonstrated a major need for our service, and that we can meet it if we have sufficient funding. We have grown, and believe we have earned the trust of those we serve. Many of our families come repeatedly, and many new clients come because they know a family already using our services. We cooperate with other agencies in our County, and get referrals from Social Services, the Department of Health, Smart Beginnings, our local women's refuge (Response), Healthy Families, Shenandoah Pregnancy Center, our local homeless shelter and food pantries. We do what we can to accommodate special cases - such as older children with diaper needs, help for families new to the area, children with special needs, and families in transition. We have the flexibility that a government agency lacks. For example, we have assisted children removed from an abusive home out of state, mothers who have missed WIC appointments for legitimate reasons, school-age children needing diapers until special medical directives could be secured, babies switched by their pediatrician to another formula before their WIC allocation was updated, babies scheduled for hospitalization who lacked food and essentials for the stay, US citizen children of illegal immigrants awaiting deportation. We undoubtedly are the smallest and most rural NDBN Community Partner selected and one reason cited was to model delivering services in a non-urban setting. We broadly modeled our service after emergency pantries in Oklahoma[ix], but remain an experiment-in-progress exploring how best to eliminate food and hygiene insecurity for infants in a rural setting. Our focus for the upcoming years is to fashion a model of service-delivery that marries cost-effectiveness with sustainability. We will facilitate discussion locally of about whether and how to move beyond co-operation between helping agencies to developing an integrated service for families with young children. Our families' needs are multi-facetted, encompassing help with housing, employment, education, health care, child care and living costs. Yet, the agencies helping them are scattered along a 40 mile long corridor. There are duplications of responsibility which represent opportunities for savings; and greater geographic clustering would enable families with limited time and funds to access help. A Small Hand is a service that families access repeatedly, and so we are uniquely positioned to provide the hub for grouping provisions. We have chosen not to pursue independent 501 c3 status until we have defined our long-term structure. We are a small all-volunteer organization, we regularly discuss how well things are working and how we might improve. All of our board members are active with A Small Hand. We encourage our families to be actively involved, many give what they can (clothes and household items that are in good condition and unopened food items they cannot use), some have worked in the shop and helped with shipments, one serves on our Board. Each week, we utilize 6-8 volunteers morning and evening serving clients. They are responsible for enrolling new clients and completing the required paperwork. Each child has a file, and volunteers keep a log of what families take on each visit. Each morning, an additional 6-8 additional volunteers pack 130-140 packs of diapers, toddler food bags and inventory and sort donated clothing; in the evening, 2 further volunteers restock the shop. Another regular commitment is collecting goods from the Food Bank, from local stores, meeting and offloading truck-loads. We have up to 6 men with pick-ups prepared to collect, off-load and store, and most weeks consume 24-30 man-hours for such tasks. Those volunteering with A Small Hand people coming to us for help, and the confidentiality of what they learn; these are the essential qualifications we look for. We have successfully found roles for volunteers aged 5 to 90, and for volunteers with special needs. Our goal is to remove food and hygiene insecurity for our target infant population and provide parents with a reliable supply of the basic hygiene and baby items that they need. We help families enrolled in government supplemental feeding programs (SNAP/Food Stamps and or WIC), and so all have been identified by professionals as low-income families, many are living in poverty. SNAP and WIC were not designed to provide a full month of nutrition and it has been demonstrated that they do not eliminate 'food insecurity'. [x] Parents are expected to be able to purchase additional food, but this is not always realistic. Sickness, high fuel bills, reduced working hours, unemployment and unplanned expenses are the sorts of events that break fragile budgets. Regular food pantries seldom stock baby items. Food insecurity affects 1 in 5 families in Shenandoah County,ix and poverty rates are even higher for single mothers with children under 5 years of age. [xi] WIC and SNAP do not cover non-food items such as diapers, wet-wipes, feeding bottles and pacifiers. Inevitably, there are times when poor families lack the money to maintain good nutrition and hygiene. Infant malnutrition - feeding inappropriate foods, watering down formula and stretching the interval between feeds - can have serious long-term consequences for infants. The first years of life are characterized by rapid growth and development, and nutritional deficits - even of short duration - can jeopardize growth and development. [xii] Children left in wet and soiled diapers are at risk for a variety of infections, some serious. Babies who are hungry or uncomfortable sometimes cry inconsolably, an established trigger for abuse. [xiii] These are the negative outcomes that A Small Hand exists to prevent. We cannot lift from our parents all of the stresses associated with poverty; but we can remove the stress of not having the basic essentials they know their child needs and provide them with more time and more focus to nurture their child. Poverty and unemployment take a toll on family relationships, and we do not want the needs of the youngest and most vulnerable to be perceived as consuming resources needed by parents and older children. While all of our parents are financially poor, most are not 'poor parents.' Rather, they do their best to provide for their children, and delight in having access to what they know their child needs - including adequate food, diapers, toothbrushes and paste, wash and books. Some are coping commendably with very difficult circumstances, including caring for infants with life-threatening illnesses. National statistics indicate that there is only one book per 300 children living in low-income homes in the USA. Last year, we gave away 1692 books, and managed to keep our book box full of books to tempt our children and their older siblings. For many low-income families additional education, training and work are the keys to a more secure economic future. But parents cannot take advantage of such opportunities if they lack the diapers, formula and spare clothing required to place a child in Day Care - even free or subsidized Day Care. A Small Hand provides them with all of these items. Such simple things can spell the difference between economic progress and remaining in poverty. Children, families and society pay a heavy price when development is unnecessarily derailed causing health, schooling and behavioral problems in later years. Our overarching goal is that every child in Shenandoah County will reach his/her full developmental potential untrammeled by inadequate nutrition and hygiene during the critical first years of life. A SMALL HAND has been operating for three years. Our average number of infant visits per week in 2010 was 9, for 2011 was 72 and for 2012 was125. Our 2012 operations are offering a good guide to 2013 demand; and we are on-track to serve the 6500 infant visits projected. We have a very committed group of volunteers and have been fortunate to recruit a number of new volunteers during 2013. We have established good relations with the Spanish Department of our local High School and over the course of three semesters have welcomed classes (10-20 students) to help with morning operations. We continue to look for ways of increasing the involvement of our parents in the operations and decisions of A Small Hand. We appreciate the impediments: we do not have Child Care on-site, many mothers work, many lack the gas money or child care to come for an extra visit. We plan to continue opening our pantry each Thursday for two shifts (9-11 in the morning and 5-7 in the evening). This offers working mothers with an opportunity to come, and increases the chances that mothers without transport can get a ride. Our target population is Shenandoah County infants [newborn - 36 months] living in poor or low income households. All of our infants are WIC-eligible [living at 185% poverty level or below] and many receive SNAP [living at or below the poverty level]. We require all parents not already enrolled in WIC to do so, simply because we cannot afford to provide for them what they could get from this government program; and we require parents to maintain good standing. The major challenge we face is raising the money we need to purchase our basic goods. Our fundraising has only just kept pace with our needs, and too often we have only one or two months of funding on hand. We have no long-term commitments or savings to rely on. We live in a rural setting with very few major businesses. We are an all-volunteer organization which some view as non-sustainable; but it is evident that we cannot currently purchase the goods we need and pay key personnel. We appreciate that the fact that A Small Hand is linked with a church is a complicating factor for some foundations, and precludes help from some others. We are grateful to the individuals and organizations within and outside Shenandoah County who have supported us since we began. Donation checks can be made to "A SMALL HAND"
[i] A Small Hand specialist pantry 2012 Service Report, Ann McBroom. Copy sent to Ronald McDonald House Charities. [x] Food Research and Action Center Report January 2010. Food Hardship: A closer look at hunger. Tackling infant malnutrition in Shenandoah County, Virginia. Good nutrition, beginning in utero and continuing throughout the first years of life, is critical for ensuring optimal health, growth and development. Children and society pay a heavy price when nutrition is inadequate. Children pay with compromised development and attainment, and our society funds the ongoing services needed to deal with the resulting health, schooling and behavioral problems. Poor nutrition takes many forms. Hunger is the most obvious, with mothers delaying feeds and watering down formula to stretch the food they have on hand. But poverty also leads to the inappropriate substitution of foods. Eating in the earliest years of life provides the foundation for a child's future food tastes and eating habits. Poor nutrition in infancy can place the child at risk for long-term obesity and related health problems. A letter in the journal Pediatrics summarizes how poverty in the US is linked to food insecurity and child malnutrition. Malnutrition takes many forms. Poor children go hungry when money is especially short, as pay day approaches, when food stamps are exhausted and when school is out and school meals are unavailable. Malnutrition is seen in the excessive consumption of calorie-dense foods - foods that provide the most energy at the cheapest price - those rich in sugars and fat. Such food choices are seen as an adaptation to poverty and an economic imperative. But such choices also establish food preferences and patterns of eating that place poor children at risk for future obesity and diabetes. SNAP (Food Stamps) and WIC are vital programs for poor families, but both were designed to supplement nutrition, not as measures to eliminate food insecurity. Families living in long-term poverty never accumulate the reserves needed to weather shortages. As with any family, emergencies inevitably arise - sickness, unexpected expenses, loss of a job, fewer hours of work. These place even greater strain on the family budget; and spending on food is often the area reduced. 1 Our goal is to assist families through emergencies, and provide a buffer for them to avoid future food insecurity. A Small Hand will provide families with access to a week's supply of food to ensure that infants do not go hungry and mothers are not forced to make inappropriate substitutions. Recent studies have highlighted the troubling state of general infant nutrition in the U.S. Contrary to expert guidelines, almost a third of babies were found to be eating solids before they were 4 months old, 17% were drinking juice before six months, and 29% were drinking cow's milk before 12 months. A separate study  showed that up to a third of babies consume no fruit or vegetable on any given day, and that French Fries is the most common choice of vegetable. Ten percent of infants 9-11 months of age eat French Fries every day. Over half of infants are eating candy or dessert every day by the time they are one year old. A Small Hand will provide only high-quality age-appropriate foods, following best practice guidelines. We also do not want infants to be left in wet and dirty disposable diapers because mothers lack the money to buy an adequate supply. This places infants at risk for skin rashes and secondary infections. Disposable diapers are a major expense; and one not covered by WIC or SNAP. For most mothers, disposable diapers are not an optional expense. Most child-care facilities will not accept an infant in cloth diapers, and mothers often lack the facilities needed to maintain a supply of freshly-laundered diapers. A Small Hand will supply mothers with a week's supply of disposable diapers and a pack of wet-wipes. The other way in which we will help parents, is by giving mothers access to gently-used infant clothing and selected new baby items at no cost. Doing so, will satisfy these needs and free up money for other uses, including reducing food insecurity. A Small Hand will supply gently used clothing, selected hygiene and other items for infants at no cost. The goal of A Small Hand is to safeguard good nutrition for infants in need in Shenandoah County. We are beginning with infants 0-36 months, hoping to grow with our infants and gradually extend services to 48 months. In order to ensure that the most needy are served, we are limiting access to infants who are WIC or SNAP recipients. To be eligible for WIC, a family's income must be less than 185 percent of the Federal poverty income guidelines. To be eligible for SNAP, net monthly income must be 100 percent or less of Federal poverty guidelines. Households may have no more than $2,000 in countable resources, such as a bank account ($3,000 if at least one person in the household is age 60 or older, or is disabled). A Small Hand will limit access to its services to those infants most at risk for food insecurity. We will be offering a service modeled on highly successful infant programs in Oklahoma and Texas. Each of these centers has developed access rules suited to its local needs. During our first year (2010), we evaluated how often families need to access our services. Our experience is that we have a core of clients who need consistent help with diapers and non-food items; while other families need help far less frequently. We share with our families that we have limited resources and limited donations; and ask them to take only what they need. Our experience is that our trust is well-placed. If indicated, we will challenge families who appear to be misusing this trust. A Small Hand will do everything possible to ensure that monies and goods donated to it go only to infants in need. The most recent figures available from The Shenandoah County Department of Social Services indicate that there are some 400 infants [0-36 months] in Shenandoah County on the WIC program. The US Census Bureau, 2006-2008 American Community Survey found that 9% of people in Shenandoah County had an income below the poverty level, and 11% of families with children less than 5 years old. A third (32%) of women raising children less than 5 years of age without a husband present were living in poverty, contrasted with 4% of women with a husband present. Access to programs unfortunately does not eliminate food hardship. A recent survey (October-December 2009) found that 18.5% of households in the US reported times during the preceding year when they had lacked the resources to buy the food they needed. Almost a quarter (24.1%) of families with children had experienced this problem. Shenandoah County lies in the 6th Virginia Congressional District, and this ranked 237th in the nation in terms of food hardship with a rate of 17.4%. Shenandoah County is probably, therefore, very representative of the nation in respect of food hardship. The available data suggest a pool of some 400 infants (0-36 months) in Shenandoah County eligible for services from A Small Hand, many of them live in families headed by a single mother. 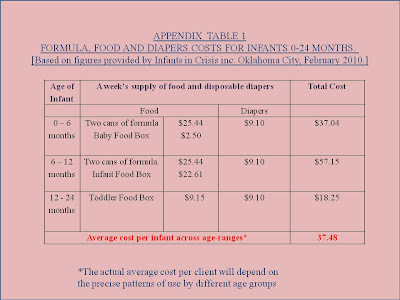 Based on current figures provided by Infants in Crisis Inc.  purchasing formula, food and diapers will average about $37.50 per infant [Appendix Table 1]. We are, therefore, projecting a need for $30, 000 worth of formula, food and diapers to service 800 visits during 2011. For every dollar of purchased material, we hope to add a dollar of donated goods and clothing; ensuring that families leave with about $75 worth of free food, clothing and baby goods. We are mindful that to deliver this program professionally and effectively will take thousands of hours of volunteered time, and we will keep a careful log indicating the monetary value of the time donated. In Oklahoma and Texas, corporations , businesses and foundations have played a prime role in ensuring the constant supply of formula, food and diapers. We too are looking for institutional support to underwrite the purchase of formula, food, diapers and wet-wipes. We will concentrate all our efforts on promoting the service, delivering quality help, securing donations of goods and establishing long-term financial support. Meyers AF, Karp RJ, Kral, JG. Poverty, Food Insecurity, and Obesity in Children. Pediatrics 2006: 118(5): 2265-2266. Fox MK, Pac S, Devaney B, Jankowski L. Feeding infants and toddler study: What foods are infants and toddlers eating? J Am Diet Assoc 2004: (1 Suppl 1)104:S22-S30. Koplan J, Liverman C, Kraak V. Preventing childhood obesity among US children, adolescents and adults, 1999-2002. JAMA 2004; 291:2847-2850. Committee to review WIC Food Packages: WIC Food Packages: Time for a Change. Washington, DC: National Academic Press, 2005. Available at www.nap.edu/catalog/11280.html. 1 in 3 families in America struggle to afford diapers for their children. 34% of families surveyed had cut back on basics such as food, utilities or child care in order to purchase diapers for their child. 22% of all children under five years of age in the United States live in poverty. Poverty is most pronounced in households led by single mothers, where 54% of children live in poverty (as opposed to 10% of children under five in double-parent households). At an average cost of $18 per week, families require $936—more than 4% of poverty-threshold income—per child per year for diapers. Families from a range of incomes struggle to afford diapers, including both families who fall below the federal guideline of poverty ($22,350 for a family of four) and families with incomes above the federal poverty guideline but who are still considered low-income. Research suggests that families earning twice the federal poverty guideline still struggle to meet their basic needs. Also click to watch an interview with the head of the Diaper Bank Network explaining why it is so important to solve the problem of diapers for poor families. 3,100,429 diapers to children in need. and 1,229,878 to children in neighboring areas. No infant should go hungry or lack the basic essentials! A Small Hand is an outreach project based at Edinburg Christian Church. Our goal is to provide help to infants (newborn to 36 months) in Shenandoah County in the form of a week's supply of formula, food, disposable diapers and wet-wipes, plus gently used clothing and baby items as donations permit. We want this to become truly a community project, and welcome people of goodwill from all parts of Shenandoah County to serve on our Board, help in our 'shop', and work to collect goods to fill our shelves.